Heart Ear Studs from the Glam & Soul collection in 925 Sterling silver. 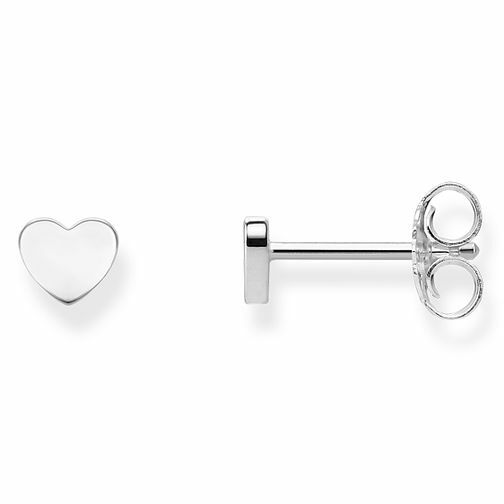 These simple yet elegant heart-shaped ear studs from THOMAS SABO are fashionable all-rounders. Thanks to their subtle simplicity and graphic minimalist design, they are the all-day-everyday staples that anyone needs in their jewellery box. Mix & match these stud earrings with other THOMAS SABO ear studs to create your personalised look and embrace the mismatched earring trend. Thomas Sabo Glam & Soul Sterling Silver Heart Stud Earrings is rated 4.4 out of 5 by 5. Rated 5 out of 5 by Anonymous from They are as dainty as they look Very pretty, lovely quality. The presentation was good too. Rated 5 out of 5 by Anonymous from Thought they would be bigger The earnings were a little small, they looked slightly bigger on the web site, but they looked great on.